It is no secret that AKG has always had a knack for making great headphones. Their AKG K553 PRO are among the best studio headphones you can get for less than $200. Today we are going to find out why that is the case, and what these have to offer. The thing with AKG in general is that they know how to make attractive headphones. These days there are brands so set in their ways that you can figure out who made the set long before you see the logo. That’s not really the case with AKG. The overall layout of K553 PRO isn’t plastered with padding. 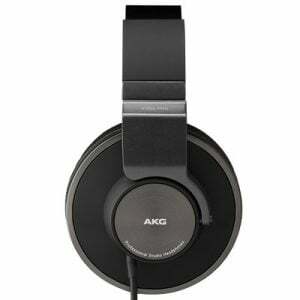 On the contrary, AKG went with a more minimalist route that still works but looks ways slicker. The headband is thin with an equally as stealthy layer of padding. What is really cool is that width of the headband. Being wider than most, it inspires confidence and delivers that level of stability. Ear pads are massive, which matches the equally large chassis supporting each driver. Even so, the entire package is fairly lightweight. From a purely aesthetic point of view, AKG K553 PRO feels and looks like a much more expensive pair. The main thing that stands about K553 PRO is the size of their drivers. We are looking at two 50mm units that pack a decent amount of heat. To be more specific, these are capable of delivering 114dB of SPL and cover a frequency range of 12Hz to 28kHz. But wait, there’s more. AKG went ahead and made these fairly low impedance. At 32 Ohms, you can comfortably used AKG K553 PRO with your mobile devices without experiencing a loss of volume. The build quality is more than decent. Even though these are far from the best that AKG has to offer, they still made sure that the frame was capable of withstanding wear of daily studio use. Lastly, when it’s time to put them away, AKG K553 PRO can be folded into a compact package. Even though it’s not a defining feature, having that bit of versatility is welcome. Looking good isn’t all AKG K553 has to offer. When you plug them in, you are in for a ride. The response is fairly flat starting straight from deep bass frequencies. It is only when you push past 11kHz that you will run into a dip. However, considering the rest of the range, that is a very small price to pay. Volume is abundant, especially since these make a tight seal and thus eliminate the majority of outside noise. There is plenty of definition and clarity, which is most noticeable in the mid range. 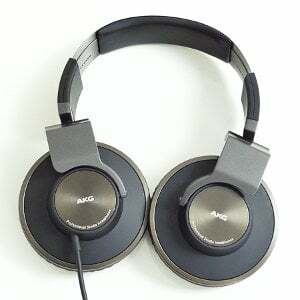 One of the main concerns people have about AKG K553 is comfort. Seeing that slim piece of padding on the headband is enough to scare some users. However, there is nothing to worry about. 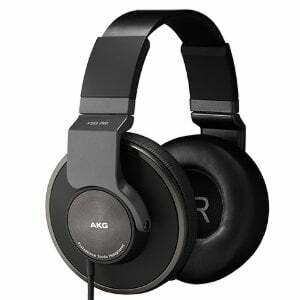 AKG made these to offer a great level of comfort by making them light compared to their size.